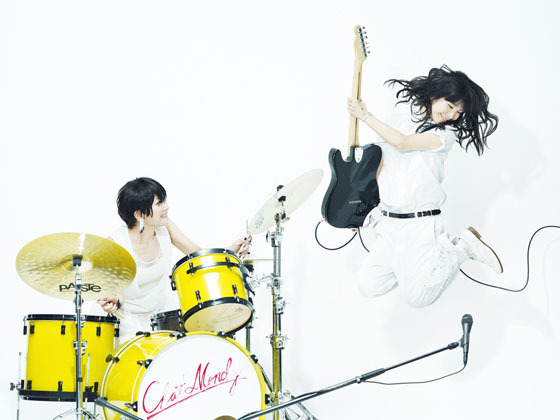 Chatmonchy are two girls from Japan who rock. Playing raw, energy-infused melodic rock music, Eriko and Acco have been making a buzz all across Japan since their 2005 major-label debut. Chatmonchy—whose name means absolutely nothing!—started as the all-girl trio of Eriko, Acco and Kumiko . They burst onto the scene without any label backing in 2004, quickly catching the ear of Sony Music Japan; the next year, Sony’s Ki/oon Records released their debut EP, “chatmonchy has come,” and the band set off on their first nationwide tour of Japan in 2006. Inspiring fans with their feistiness and fire, Chatmonchy released their first full-length album, “Miminari,” in July of the same year. The album garnered a Top 10 spot on the national Oricon chart, and the girls were invited to perform at Japan’s most important summer festivals, including Summer Sonic, the Rock in Japan Festival and the Nano-Mugen Festival. After the success of their summer festival dates, they did a national tour in the Fall of 2006, then headed back to the studio to finish “Seimeiryoku” (Life Force), the album they had started writing the year before. The album was released in late 2007, reaching #2 on the Oricon charts, and Chatmonchy played sold-out shows all around Japan —including a two-night solo concert at the Budokan in the Spring of 2008 in front of more than 16,000 fans! Following the first album, the rock-power girl trio released five singles that reached the Oricon Top 10, three that hit the Top 20, and seven DVDs including music videos and passionate live performance footage. In addition, the single “Dai Dai,” was featured as the theme song on the anime series “Bleach”—their first step toward connecting with a worldwide audience. In 2010, Chatmonchy performed at the Japan Nite of the SXSW Music Conference, and then joined part of the subsequent Japan Nite Tour in New York, San Francisco, and Los Angeles; they also performed at Amoeba record stores in San Francisco and Los Angeles to huge press response. SPIN Magazine picked them as the first band in their “SPIN’s 50 Must-Hear Bands at SXSW” and then named them as the “Best Stateside Debut” at SXSW. On the homefront, they released the B-side collection album “Hyojo” in March, during the U.S. tour, and one mini-album “Awa Come” in October in the same year. In 2011, the band released a full length album, “YOU MORE” in April, followed by a hugely successful 29-date national tour of Japan. While Kumiko left the band in September, Chatmonchy will go on tour again with a new form in November and December for a four-city tour in Japan.